4:00 p.m. | slide presentation by Kurt Wulfmeyer, fabricator, who will describe how he realized the artist’s dream to construct her work on a monumental public scale. Reception to follow. Opening reception: First Friday, May 6 | 6:00-8:00 p.m. Enter the Woodmere's contest by uploading a photograph of the sculpture to Instragram by 4:00 p.m. on June 11, 2016 with the hashtag #Spring&Triangle. 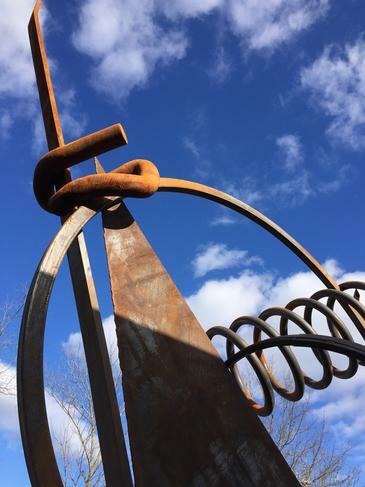 Include a correct guess of the weight of the 30-foot sculpture and receive a one-year Woodmere membership and a genuine industrial spring collected by Dina Wind in her search for the materials for her sculpture!